After a long Monday at work, I was ready to get home and ready to grill up a storm for tonight's NCAA men's basketball championship game. Unfortunately, Mother Nature beat me to the "grilling up a storm" part. Squall lines, strong winds, and tornado warnings made me reconsider. The only reason my First Up covering wasn't flying away was because we had it tied down and 40+ pounds on each of the 4 feet. 2) Peanut oil has a high smoke temp, tolerate of stir fry temperatures. Together, the two are a nice blend for my tastes. Preheat your wok over medium high heat. Season the chicken with salt and pepper. The thing about stir frying is that it happens so fast. You HAVE to have all your ingredients prepped and measured out (aka "mess in place" errr..... mise en place). See? I CAN cook without a grill. I just don't like to. Add the oils. Once hot, add the chicken and stir fry until done. This should take about 3-5 minutes depending on how hot you got the wok. Remove from the wok and add a Tbsp more of peanut oil if needed. Add the bell pepper and onion. 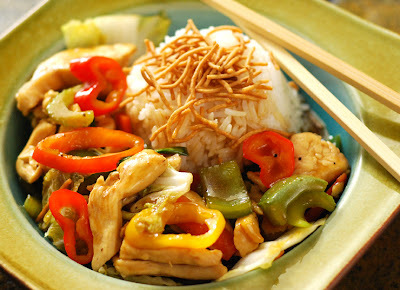 Stir fry for 1-2 minutes. Add the sweet mini peppers, celery, and the firmer white parts of the green onion. Stir fry for 1 minute. Add the ginger and garlic, stir fry for 1 minute. 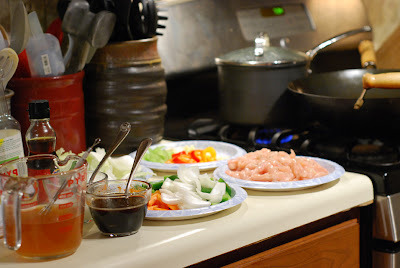 Move the contents to the edges of the wok and add the Yoshida's, hoisin, sriracha and chicken stock. Allow to come to a simmer for 30 seconds. Stir together the cold water and starch to make a slurry. Add enough of this to thicken the sauce. You want a consistency that when you dip a clean spoon into the sauce, it clings lightly to the back of the spoon. Return the chicken to the wok. Add the napa cabbage and green parts of green onion. Toss, reduce heat and cover for 1-2 minutes, just enough to wilt the cabbage. 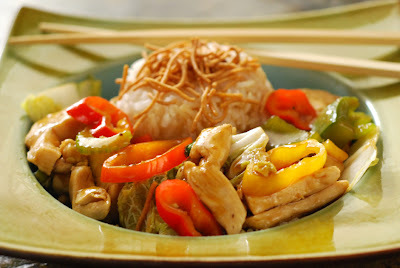 Serve with sweet jasmine rice and top with crispy rice noodles. The whole family liked this one and all 4 of us had seconds. The worst of the storm has passed so now I can enjoy the lightning flashing and the thunder echoing across the valley. It makes me appreciate being at home, safe, dry, and with a full stomach. Very thankful.